Joovy has just released their new single stroller, the Scooter. Beginning with its unique handlebar, the Scooter is full of surprises. I wasn’t really sure what to expect, but I was very pleasantly surprised. This little stroller is full of features often found in much higher priced strollers and it offers an amazingly nice ride, all for a really great price. The first thing you will notice when you look at the Scooter its center handlebar. A great alternative to the double handles on an umbrella stroller, it makes pushing so easy, even one handed, which can be tricky with an umbrella stroller. There are so many nice touches, like the full canopy with pop out sun visor and peekaboo window, reflective trim, parent cup holder in the handlebar and the very nice mesh pockets in the sides of seat. These pockets are so handy for drinks, snack or toys and will keep your child very happy. The four wheel suspension is great. We rolled over very bad sidewalks and instead of jarring bumps, the ride stayed smooth, great for such a small, reasonably priced stroller. The fold is easy and the basket is huge, really, really huge. The Scooter offers a nearly full infinite position recline, so it’s great for naps. A really big plus- car seat compatibility. The Scooter can take a Graco car seat on its bumper bar and comes complete with the straps that hold a car seat fixed in place in 2 handy pockets at the sides of the stroller. This is a really thoughtful touch. The Scooter weighs in at 20 pounds, but feels very, very light. It has an impressive weight limit of 55 pounds, so this stroller will take you very far. 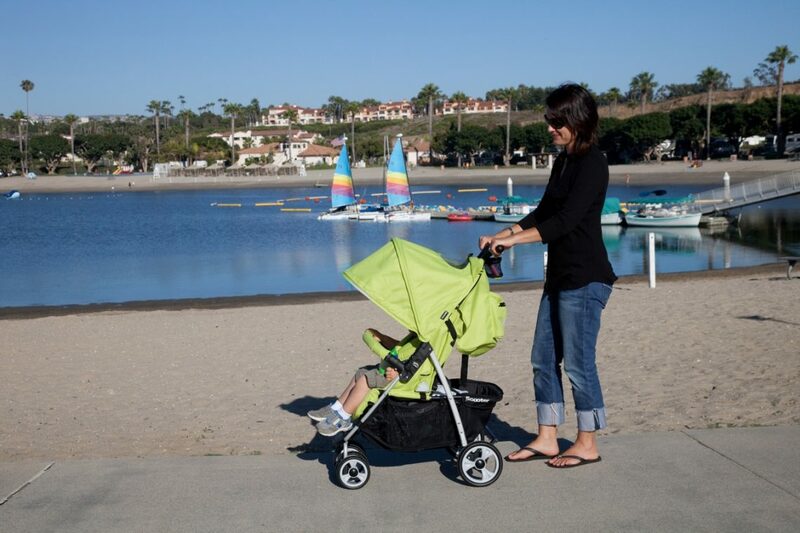 For a very low price, Joovy is offering an exceedingly full featured, small stroller that is great for travel, around town and will keep your child happy and comfortable from birth all the way up to 55 pounds. My 9 month old daughter loves it and my very tall 45 plus pound 3 year old has room to spare. Now, for the very best feature of all, the price. The Scooter has a list price of $149.99. Amazing, but true. This stroller offers so much, that you will think you’re pushing a much more expensive stroller. I was very impressed. Please visit www.Joovy.com for more information on the Scooter, the full line of Joovy products and for a link to their Facebook page. 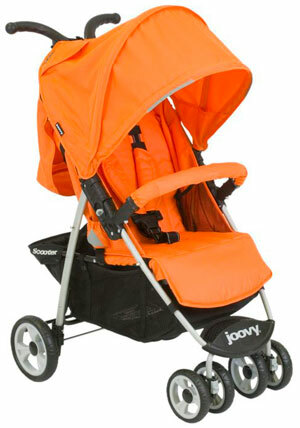 *Joovy provided a sample for review.